(CNN) -- Liverpool's Spanish manager Rafael Benitez has signed a new deal to keep him with the Premier League club until 2014. 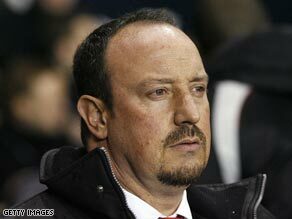 Benitez will be staying with Liverpool until 2014 after finally signing a new contract with the club. The former Valencia coach, who led the Reds to Champions League glory in 2005, has been in contract talks with the club for much of the season. Benitez told the official Liverpool Web site: "My heart is with Liverpool Football Club, so I'm delighted to sign this new deal. "I love the club, the fans and the city and with a club like this and supporters like this, I could never say no to staying. "I always made clear I wanted to be here for a long time and when I complete my new contract it will mean I have spent over a decade in Liverpool," added Benitez. Benitez had reportedly rejected five offers of a new contract but the news last month that Liverpool chief executive Rick Parry will be leaving at the end of the season was seen as a sign that the manager would stay with the Merseysiders. Benitez, who fell out with Parry over the latter's failure to close several transfer deals, added: "The club is greatly respected around the world due to its incredible history and tremendous heritage. It is my aim to uphold those values and help create a new chapter in our history. "Throughout this process, I would like to thank the owners for their hard work in finalising the deal. All of us at the club want the same thing, which is to be successful by winning major trophies." The announcement comes just days after Liverpool hammered Manchester United 4-1 at Old Trafford, which followed a 4-0 demolition of Real Madrid in the Champions League last week. Co-Chairman Tom Hicks said: "It is wonderful news that Rafa has made a long-term commitment to the football club. "Since he became manager in 2004, he has been responsible for the great progress we have made. I know he will continue to build on his achievements as he has a tremendous hunger and desire to bring more success to the club -- success our fans and everyone connected with the club deserves."